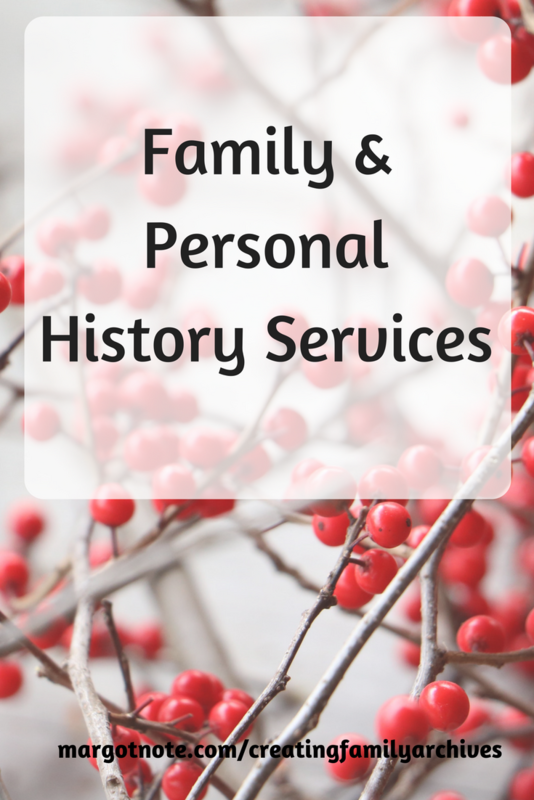 This holiday season, I'm sharing some entrepreneurs and small businesses that offer services related to memory, legacy, and family and personal history. I wish to amplify their reach so that as many people as possible know about their offerings. I've noted the location of the businesses, but like most things these days, the Internet gives them the power to serve clients around the United States and the world. 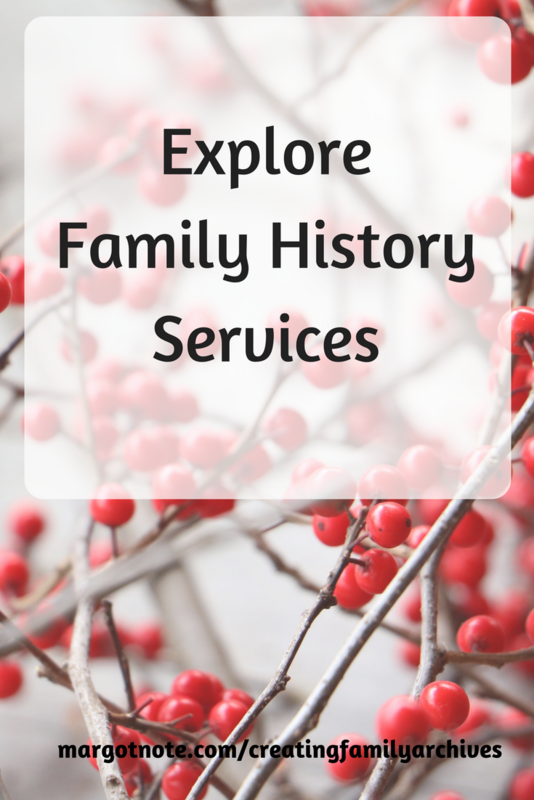 For example, I offer Family Archives Packages, and many of my clients aren’t local. Depending on the project, companies and clients can connect as easily by email or by phone as in person. Speaking from my own experiences, owning your own business is a labor of love. We work hard to provide unique, quality experiences and to delight our clients. By supporting smaller businesses in this field, you are helping others who share your values. I've also asked my contributors to share their suggestions for capturing memories during the holiday season. What are yours? As owner of The Beauty of Books, I provide book design (along with sometimes just cover design), production, and print supervision with printers ranging from Create Space (gets you on Amazon) and Ingram Spark (gets you into bookstores) — both Print-on-Demand (POD) — to short-run digital and hi-end offset. I offer scanning (with a large format professional scanner) and/or full project management, if needed. I also offer self-publishing guidance to those who are wanting to get their books out into the world. This includes working with Create Space and Ingram, as well as offering recommendations for distribution, publicity, and social media help. I think the most important service I provide is that I lend my ear as a human being alongside 40 years of experience. Tip for capturing memories: The way I capture memories best is through my eyes and my ears. I watch. I listen. I open myself to those around me, drawing out my grown nieces and nephews, my son and daughter, wanting to hear THEIR perspective on how the world—and their lives within it—are turning. I find that it is such a gift to learn from others. I always seem to grow, no matter what kind of experience I am around. Cider Spoon Stories is Austin's premier ghostwriting and editing company. We help seniors, veterans, small business owners, and others share their stories with the world. We have a book sale of 2 for $25 and free shipping when you use two discount codes: FREESHIP and HOLIDAY17. Tip for capturing memories: Instead of staring at the TV screen after that double helping of turkey or ham, tune into each other. Oral storytelling was the original form of entertainment! Ask questions. Listen. Laugh. Love. greetingStory Memory Boxes are the perfect activity for your next family gathering whether it's Thanksgiving, Christmas, or a family reunion. Each Memory Box includes our famous storytelling cards and tips designed to spark conversations, collect incredible stories, and to preserve your family memories. greetingStory cards make it easy to capture our life stories by providing you with questions and instructions so all you have to do is share your memory inside the card. Each Memory Box comes with illustrated question cards designed to help your family share memories and powerful stories. Each card includes tips & instructions, written by our team of biographers, to help guide your loved one in sharing their stories. greetingStory Boxes come in 12, 24, and 48 card sizes. When you order, we will email you our card catalog so you can customize the cards in your box (or let us choose for you)! Our cards have been proven to be simple and fun and you will love the priceless memories you collect. Use the discount code BLACKFRIDAY35 for 35% off your entire order. Tip for capturing memories: At greetingStory, our goal is to make capturing memories during the holiday season fun and stress-free. The number one tip we can give to make this process easy is to have a set of questions ready to ask your loved ones about different moments in their lives. After 30 years as an illustrator in publishing and advertising, I now help busy parents tell their family stories by empowering them to organize, rediscover, and curate their print and digital images. For the holidays, I’m adding one bonus hour of "Take better photos with your iPhone" if someone buys an Apple Photos: 8-Hour Coaching Package. Tip for capturing memories: If you have a new phone, take the time to understand all of the new features. Be intentional while taking pictures. Make every photo count as if you were using a film camera. Take more pictures inside than outside. Mix family candids with posed photos. If you have to take pictures inside, place your subjects next to a window. JournalScribe helps individuals and families preserve, protect and share their handwritten history. Collections of paper records are not easy to share, and they can be lost forever to flood, fire, and time. I scan and transcribe these handwritten collections of letters, journals, diaries, logbooks, recipes, etc., and provide you with a beautiful keepsake book and the digital files, ensuring that your handwritten family treasures are preserved for generations to come. I am offering a 20% discount on all projects initiated by 12/31/17. Tip for capturing memories: This isn’t so much about capturing memories as it is about keeping memories. My tip is, “Back It Up!” Whether you’re recording photo or video memories on your smartphone or writing down your thoughts about a special event in your journal, to keep these memories for the long term, back them up. Back up your digital memories to the cloud or to your hard drive. You can connect your phone to your computer and easily download video, audio and photos to your computer. If the data becomes irretrievable or the phone is lost, you will still have those memories. For paper records, create a digital file by scanning or transcribing so that if your journal is lost or damaged, your memories are still preserved. I am a personal biographer. I meet the people who want to share their stories, or their family's stories, and collect all their materials (interviews/pictures/documents...). I usually meet my clients were they live, because I think that it is important that they feel comfortable when they tell their memories. I write their stories in a literary text and following their wishes regarding the genre of the book. For example, it can be a novel, an interview, or a memoir written in the first person. I professionally design the book and its cover if needed. I digitally capture pictures and digitally restore them if needed with professional software. I manage the relationship with printer and binder; the books are customized according to the client wishes because the cover and the binding are handmade. If someone already has a finished text, I can just edit it and get it printed. I can also handle copyright-related problems, as I have in-depth experience in royalties contract negotiation. I work in Italy and mainly in the Italian language, but I can carry the interviews in English. I have solid relationships with publishing professionals in the UK who can take care of the writing/editing in their native language. Tip for capturing memories: Sitting down with one's family and lingering on family memories with an older relative, recording stories or writing them down in a family diary. Taking pictures and notes of these very moments too. This present will be tomorrow's past (and too many people tend to forget how important their present is in terms of personal history). StoryKeeping uses the power of filmmaking to capture the legacy of families and businesses. Since 2009 I’ve been honing a process designed to expose the heart and character of my subjects, and this results in the most personal and organic interview footage in the industry. Tip for capturing memories: Break the ice with your family elders by asking for their perspective on a challenge you’re facing. By first being vulnerable and letting them know you value their thoughts, they’ll drop their guard and be more likely to open up in return. Generational barriers don’t have to exist if you treat people like the human beings they are. Strange Stock Art Conservation provides preservation services relating to the repair and care of works on paper and photographic materials. The studio is led by a Professional Associate of the American Institute for Conservation of Historic and Artistic Works (AIC). Focusing on a wide range of materials, the studio frequently conducts treatments for often overlooked historical objects, such as music memorabilia, tattoo ephemera, folk and outsider art. The studio serves private collections and larger institutions, with special consideration for inherently fragile artifacts. All objects receive comprehensive written and photographic documentation throughout examination and treatment. Consultation services are available in-house, onsite or for emergency response. Whether you have a few pieces or an extensive collection, storage and display options in consideration of how an item will be used in context are paramount. I offer complimentary shipping for my out of state clients on approved jobs. Tip for capturing memories: I love making memories around the holidays, practicing old traditions and creating new ones. But, this is my tip that I should heed—make sure to plan ahead! I am famous for wanting to give personalized, unique or handmade gifts to my family and friends—and typically underestimate the time is takes to bring these ideas to fruition. Even if you work well under pressure, just make sure to give yourself enough energy to allow these presents to come to life—that way you can actually enjoy the best part, giving the gift!